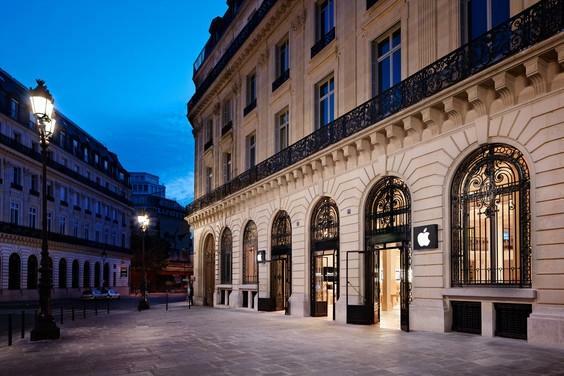 Armed and masked robbers made off with an estimated $1.3 million in Apple products during a heist of an Apple store in central Paris on New Year's Eve. The robbers gained access to the store via a service entrance where they assaulted the store employees, and then "calmly" picked through the boxes of Apple products, taking iPhones, iPads and MacBook laptop computers, according to Dow Jones Business News. The store closed at 1700 GMT (9 p.m. Pacific time) on Monday with a single security guard and a cleaner present, and the thieves entered three hours later. The robbers then apparently loaded the stolen products into a vehicle and fled the scene. According to French news reports, the estimated loss was pegged at around $1.32 million U.S., though the police have not confirmed that amount. The extent of injuries to the store employees were said to have been slight. A police spokeswoman did say that Apple employees are conducting an inventory of the store's products to determine the loss. Apple products have been targeted by robbers in the past in France. In July 2012, a van carrying Apple products was carjacked by robbers with assault rifles in Aulnay-sous-Bois in Seine-Saint-Denis. Apple's stores are on occasion targets for theft, given the valuable merchandise the company sells at its retail locations. One attempted robbery in 2011 at a San Diego Apple Store led to a shootout in which a security guard killed one suspect.